A vertical computer monitor allows you to view your screen in a portrait mode instead of a traditional landscape mode. In this position it will have more height then width. You’ll be able to fit more text on the screen, and it will make your search engines more effective. While wide screen monitors in a horizontal configuration are great for gaming or watching movies and stream-able content, when it comes to browsing social media, e-mails or text heavy websites, a vertical monitor is far more effective. There is virtually no benefit of a horizontal wide screen in these circumstances and most of these websites work in a scroll down fashion. This is where the best vertical monitor excels. You can see far more on the page. Which Vertical Monitor is Best? How you plan to use your monitor will help determine which is the best vertical monitor for you. If you’re using your monitor for basic computing like reading emails, paying bills, and checking social media, you won’t need a high-end monitor with multiple features. Multipurpose users are also streaming videos. They‘ll want a full HD monitor with LED or IPS display. Professionals, especially photographers, will want high resolution and color clarity, while gamers will want to have a quick response time. • IPS: In plane switching monitors offer accurate colors and deeper blacks. They are terrific for photography, gaming, and graphics work. • LED: Light emitting diode monitors provide an excellent over-all quality. They offer bright images and use little power. • LCD: Liquid Crystal displays offer quality performance at an affordable price. • Touchscreen: Touchscreens are nice for multipurpose use and allows the computer to mimic a tablet. Screens under 20 inches are fine for sharing photos and reading emails. You’ll want to have a 21 to 26 inch display for also watching TV or playing games. 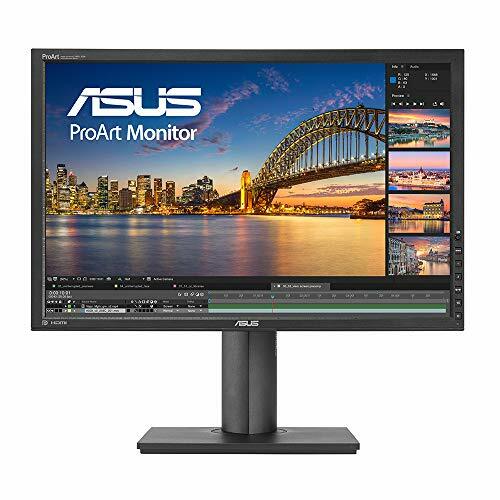 Monitors with screens measuring 27 or more inches are enjoyed by the serious gamers and professional photographers and graphic artists. • HD and HD+: this provides quality pictures at a reasonable price. • 4K Ultra HD: this is the best resolution currently available and it offers the finest detailing for professional use. This HD vertical monitor provides high definition viewing with HDMI and VGA display ports. The bezel is extremely narrow with a width of only 8mm. That is part of the reason why this is a good monitor if you are looking for something to use for multi-screen viewing. Add to these features the ergonomically designed stand and you have a screen that can tilt, swivel, and pivot. Even the height is adjustable. The ASUS VN279QL provides clarity by using ASUS Vivid Pixel Technology in its design. The result is a detail oriented visual. This model also includes a high definition mobile link for your tablet or smartphone as well as HDMI/MHL, D-Sub, and Display Port connectivity for all of your other electronic devices. The Dell Ultra Sharp 1909W is a well designed vertical monitor. In addition to portrait mode, you can turn it horizontally for a landscape screen. The sturdy base allows you to swivel the screen as well as tip it up or down for your convenience. It has a LCD screen with TFT active matrix, and the two USB ports on the side are a handy feature to have for connecting to all of your favorite devices along with the a DVI and VGA port. The 300 cd/m2 image brightness and image contrast ratio of 1000:1 can be adjusted by using the control panel on the front of the device. The screen temperature is on the warm side with inky black pixels similar to a OLED display. Bright, crisp graphics on the 19 inch display screen makes this monitor a great option for gaming as well. There is also a removable speaker included that easily slides off when not needed. The fact that this portrait monitor is bundled with a mounting arm sets it apart from other available options. The monitor itself is ultra thin, and it easily attaches to the arm that is included in your purchase. This arm gives you the ability to rotate the device from landscape to portrait as well as tilt it forward by five degrees and 70 degrees backward. It attaches to any desk that measures between 0.4 and 2.4 inches in thickness and gives you a way to completely customize your experience. The 23.8 inch screen is surrounded by an astoundingly thin 6.05mm border. This combined with the 178 degree viewing angle makes it easy to view whether it is viewed by one single user or several onlookers. Connection to other devices is made possible by the three USB ports. You’ll be able to view content from your favorite devices in high definition, including your tablet or smart phone. All of this is made possible by using an eco-conscious design. The materials used are BFR and PVC free, and it has arsenic free glass, a mercury free LED panel, and a chassis created from 25% post-consumer recycled plastic. The ProArt Professional Eye Care Monitor offers a professional grade quality when it comes to color fidelity. You’ll be getting industry leading color accuracy with a 100% sRGB, 16:10 aspect ratio. It is described by the manufacturer as an eye care monitor because users experience less eye fatigue due to the built-in, flicker free technology. This makes it perfect for anyone that plans to use their monitor for extended lengths of time whether for work or creativity at home. All of this modern technology is housed on an ergonomically designed stand and it can also be adjusted for your comfort. Simply tilt, pivot, or swivel until it is just right for your individual needs. It also has a height adjustment and can be used in a landscape format as well as portrait. Data transfer is ten times faster than with the average monitor due to the four USB 3.0 ports. Extensive connectivity is also provided by HDMI, DisPlay Port, D-Sub, and DVI-D connections. This full HD (1920 x 1080) monitor by HP has a large 23.8 inch screen with micro-edge IPS. This ultra-wide width is ideal for use in multi-monitor set-ups that appear seamless from one screen to the next. With two million pixels and an aspect ratio of 16:9, you’ll discover vibrant images with crystal clear visuals. In addition, the image will look crisp and fluid rather then blurred due to the response time and refresh rate of 5ms and 60Hz. Connectivity with this HD vertical monitor is provided by HDMI, HDCP, and VGA ports. Combine this with built in speakers for a total audio and visual experience in one environmentally friendly, energy efficient piece. The screen is constructed with Mercury free, LED back lighting and Arsenic free glass while energy efficiency is promoted in this monitor with a low-voltage halogen design. This 27 inch designer monitor by Ben Q includes 2560 x 1440 QHD resolution and optimal color precision along with several other user friendly features. It is OS compatible and can work with Windows 7, Windows 8, Windows 8.1, and Windows 10 as well as MAC. The unique Dual View Function allows you to split the screen into two distinct windows. It works with a variety of display modes side by side including CAD/CAM, Darkroom, and Animation modes. The display can be used in landscape or portrait mode. The flicker-free visuals with low blue light are all part of Ben Q’s eye care technology that this monitor takes advantage of. The result is an easy on the eyes screen that is ideal for extended use. For additional comfort, customized monitor settings are provided by the Display Piot Software. Connectivity is provided by Display and USB ports. Built in speakers enhance the over-all experience, and a headphone jack allows you to use this device without disturbing others. The Ben Q Vertical Monitor is a favorite among photographers. It includes a glare shield that allows you to easily use this design in areas where it is often difficult to view the image on a typical monitor. The Adobe RGB color space technology allows you to elevate all of your DSLR camera’s images to their full potential with a set of vibrant color management features. It is ideal for nature shots as it gives you a more realistic color image with a 10-bit display that can produce over one billion shades. In addition, you’ll be able to achieve improved RGB color blending accuracy with a 14-bit 3D Look Up Table. Copies of an image remain consistent to their original form without being changed by graphic settings due to Ben Q-s hardware calibration on this 27 inch monitor. You’ll find you can keep the color performance of this piece at its optimal state by using the Palette Master Element along with a calibrator. 109 pixels per inch and 2560 x 1440 QHD Resolution allows you extreme detail in everything you create. The bezel free display on this HP LED Backlit Monitor allows you to experience ultra-wide viewing with seamless imaging when using a multi-monitor set-up. This display can be easily seen from any angle. You get a 178° viewing angle whether using it in a vertical or horizontal position with consistent image and color clarity. A full HD display means that you will enjoy crisp images and brilliant visuals with every use. HP My Display software lets you save your preferred OSD settings. Also, this monitor includes a plug and play design for use with any OS device. The built-in USB ports will provide quick connectivity. The entire piece is conveniently sized at 24.45 inches wide and 14.63 inches high and a depth of only 1.4 inches. 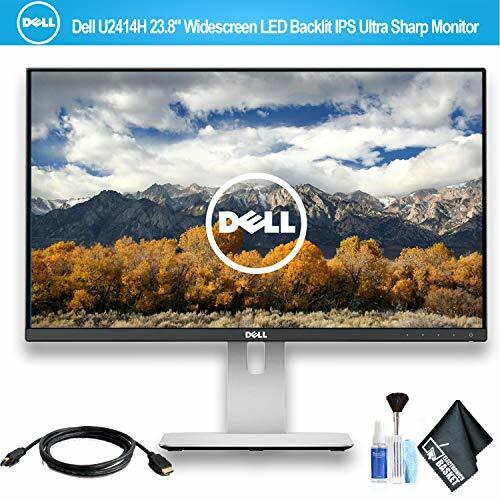 This vertical monitor by Dell is built for professionals. You can work in front of it for long hours without experiencing eye fatigue due to Dell’s Comfort View feature. It reduces blue light emissions and offers a flicker-free image while maintaining stunning visuals. Slim borders around the display provide an unobstructed view that is especially nice when using multiple monitors. Superb picture quality is provided by a high 4,000,000:1 contrast ratio. You’ll discover consistent color representation, even with the wide viewing angle. 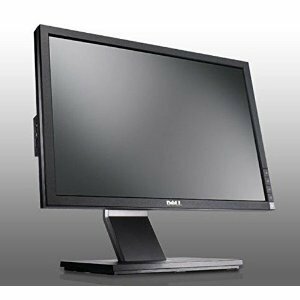 The Dell Professional Monitor is completely adjustable for maximum comfort with a base that swivels, pivots and tilts. You can also adjust the height as well as change it from a vertical to horizontal display. Multiple ports found on the bottom and side of the monitor allows you to connect to a variety of devices. Customizable color settings give you more control, and the Power Nap feature helps you save energy.